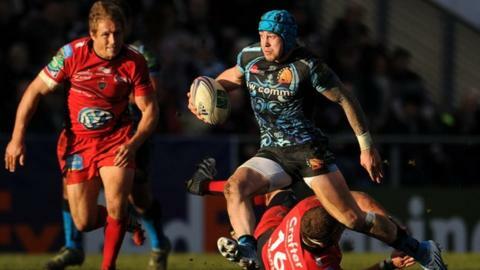 Exeter head coach Rob Baxter says his team are "very, very close" to making a breakthrough at Heineken Cup level. The Chiefs, in their second season in the competition, pushed holders Toulon all the way on Saturday before falling to a 14-9 defeat. "You don't tend to win the Heineken Cup in the first or second year you're in it," he told BBC Radio Devon. "We're very, very close to some good teams and it's not the end of the world - it means sooner or later you win." The defeat leaves the Chiefs - who did at least claim a closing bonus point at Sandy Park - in third place in Pool Two, and Baxter said his players now have to travel to the south of France next weekend and beat Toulon in the return fixture. Baxter said "nothing else will do" after setting his side the target of taking five points from their back-to-back games against the reigning champions, who boast Jonny Wilkinson, Bryan Habana, Matt Giteau and Bakkies Botha in their star-studded side. "I just hope this defeat doesn't hurt the players too much," he added. "Physically they're giving a hell of a lot and not really getting the rewards they deserve. But it's little steps and you have to not overreact to wins and losses and make sure you see the game for what they really are." Baxter said it was important to view the game in the context of the club's rapid rise to the elite of European rugby. "I don't think we could have done much more in terms of attitude, endeavour and ambition," he said. "We held the lead for long periods of the game and a lot of what we did held up very well but Toulon got a bit of a stranglehold on territory in the second half and that ultimately decided the game. "What we have to do is to keep working on their skills and decision-making and working hard to become a better team because if we keep showing that attitude and endeavour and get the rugby in between 100% right then we'll be a very, very good side. "That's the battle as you're trying to become a Heineken Cup team - lots of teams play Toulon and lose so we've got to make sure we react in the right manner and work on the things we genuinely can improve for next week. "It feels hard to be critical of the players after what they've done. We asked them to be adventurous, to be brave and they were. "Everyone will realise that we have to get our balance right in terms of when to kick and when to run. That's our battle and I don't mind that being our battle - I'd rather the battle was that we play too much, rather than we're afraid to play. "We're not going to change from that kind of side. We're not going to start kicking everything and become a defensive side, that's not what we want to be as a team." Chiefs youngsters Jack Nowell and Henry Slade, who came on at fly-half in place of the injured Gareth Steenson in the first half, both put in eye-catching performances and earned praise from Baxter. "Henry Slade came on very early in the game and I think for a guy being pushed on at that stage, in a game of this magnitude and against that opposition, he did fantastically well," he added. "Jack looked like a real momentum gainer and a real line-breaking threat for us. These guys are going to drive the club forward for a number of years."